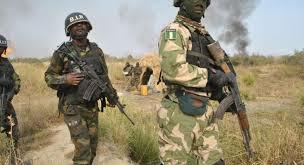 Troops of the 21 Special Armoured Brigade deployed in Operation LAFIYA DOLE, in a joint trans-border operation with troops of the Cameroonian Defence Forces, killed five Boko Haram terrorists in the border villages of Yabiri Kote and Bula Dadobe of Bama Local Government Area Borno State. The joint operations, tagged: “Operation RAINBOW 15” which was conducted from Saturday 15 – Sunday 16 September 2018, came on the heels of the discovery of makeshift bases, established by the terrorists in Yabiri Kote and Bula Dadode from where they launched attacks on villages in Cameroon and Nigeria. A statement by Bigadier General Texas Chukwu, Director Army Public Relations said, during the joint trans- border operations, the gallant troops recovered some items from the terrorists. “The items include: 3 AK 47 rifles, Two Improvised Explosive Device ( IED) Shells, One primed Improvised Explosive Device (IED) Belt, Two motorcycles, Eight bicycles, Improvised Explosive Device (IED) Vest, and One Boko Haram flag. “The trans-border operations have successfully cleared the insurgents from the general area of Kote Kura. “Members of the general public are advised to report any suspicious movements or activities to the law enforcement agents for prompt action,” the statement added.